This book was recommended to me by a neighbour and a friend who happens to be a teacher. She read this book to her middle-grade class and raved about it. After learning the subject matter of this book, I knew I couldn't pass up this recommendation. I am a strong supporter of books that tackle tough and relevant topics. 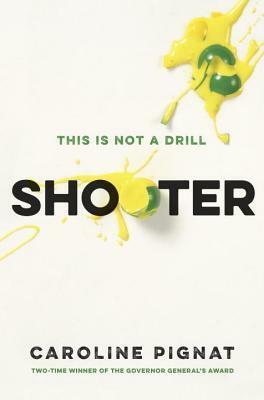 Shooter definitely hit the mark when it came to addressing the hard yet real-life issues that students endure on a daily basis: bullying, social and academic pressures, fitting in, not fitting in, etc, and what these students do to cope with the stressors of their lives. Shooter spans over the course of an hour. 5 students locked in a Boys washroom during a school Lockdown drill...only, it is not a drill. As referenced, this book definitely takes on a 'Breakfast Club' vibe, which I loved. Hogan(the jock), Xander(the nerd), Isabelle(the princess), Alice(the good girl) and Noah(Alice's autistic brother) are all polar opposites. Throughout the novel they clash more than once, but despite some of the hostility and their "social rankings" there are moments of beautiful vulnerability. Glimpses inside their souls and the darkest corners of their thoughts. With some of the horrible headlines hitting the news and shows like 13 Reasons Why, this book couldn't be more relevant for the time we are living in. Bullying is a worldwide issue, it's a pandemic. We are losing so many lives due to the actions of others, or the lack of actions entirely. I think this is a book that belongs in every school curriculum. It needs to be on every teacher reading list. What I loved most about Shooter was its ability to handle these matters in a way that didn't make this book inaccessible to the youth. It's perfectly appropriate for a young reader. This is my first book by Caroline Pignat, but I am already eager to dive into her previous and future work. She has a simple writing style that makes for an easy breezy reading experience. Shooter was a fast-paced novel that had me flying through the pages, desperate to know the outcome. It's both heart-wrenching yet hopeful. Shooter was a great read with an even greater message!